Here are some things Louie and his new amigo Ramon do in Miami: Lie on the sand after Louie’s non-drowning incident; share a drink and some smiles at the hotel bar; relate their stories of immigration; share a bicycle; sip beverages from green coconuts; laugh; fix up the bicycle a little; laugh some more, or possibly giggle; MERRILY CHASE CHICKENS; smoke cigars; take a happy swim together; toss a football around and roughhouse in the surf; have a terribly confusing conversation about where all this has led them. “There’s a lot of things that we maybe could do that might be nice, but we can’t ‘cause someone will think we’re gay,” Louie says in the stand-up epilogue to “Miami.” It’s hard not to wonder if, with this observation in mind, C.K. simply sketched a list of activities he and his handsome companion could enjoy in blissful, fictive ignorance of society’s assert-heterosexuality-at-all-times-always mandate. “It’s rare to see anyone depict the awkward intimacies of straight-guy bonding this nakedly,” wrote Rolling Stone’s Rob Sheffield. “It’s the bromance Lost in Translation.” That captures it terrifically. This is an episode quietly adventurous and contemplative in the indie-film fashion Louie adopts when it’s at its best, and there is literally so much lost in translation between these two guys. Part of the courage on display here is C.K.’s attempt — in an installment already set out of his NYC comfort zone — to let the sights tell the story. 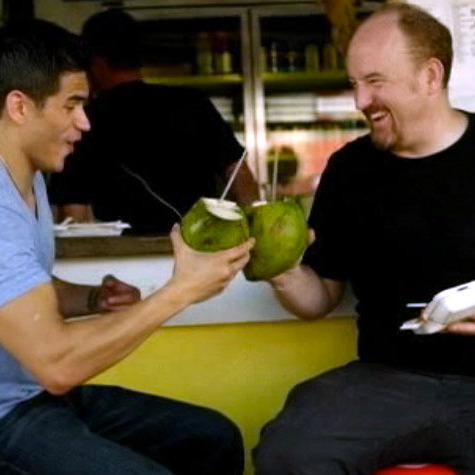 Many of Louie and Ramon’s bonding moments come in a mid-episode travelogue of “real Miami.” Few, if any, comedian-centric TV shows have relished visual presentation so openly. Louie gets sniped by commenters around the web for what they perceive as his “first-year film school student sensibilities,” by folks perhaps willfully unaware that C.K. is by trade a stand-up comedian and by choice the showrunner of a starkly low-budget series attempting to do unusual things. This montage is sumptuous, it serves the episode well, and most important, it’s fun. The first five minutes of this episode are nearly entirely sans dialogue. But even with this strong visual focus, C.K.’s dialogue writing is concise and sneakily hilarious. “I’ll stay here with you for a bit,” Ramon tells a saltwater-spluttering Louie, an introduction loaded with double meaning. Later, Louie tells Ramon, “I wasn’t drowning, but I’m glad you saved me.” It’s a fine line on its face, or a fantastically corny metaphor some blonde said to someone tall and dashing onscreen in the nineties a bunch of times. That last comment comes when Louie thinks he’s seen Ramon for the last time. There’s no doubt about it: Dude misses his bro. A few hours ago he was riding around in a sweet car full of cool guys, heckling passersby in Spanish, being whistled at by cars of cute ladies, and now he’s back in the hotel room where he earlier ordered a sandwich, took a few bites, fell asleep, woke up, and finished the sandwich. What kind of cruel life is this? So Louie calls Janet, who is still his ex-wife (continuity!) and still great at running a conversation with him. He did “meet someone,” and it took Janet’s nudging for him to realize it. Louie’s exasperation at the end of this exchange is pricelessly believable. Even three years after a divorce, Janet knows Louie better than he knows himself. And that’s the least of his worries as he now hunkers down to spend a night dealing with the idea that he just asked his ex to take care of their kids so he could spend a little more time getting to know someone special, and that that someone special is a man. So, in what felt to me like an ambiguous closer, Louie resigns to something. He may be giving in to the misunderstanding, very possibly saying (without saying; again only by showing), yeah, sure, I’m gay because he’s so exhausted defending his heterosexuality when he just wants to hang out with his new buddy. He adds a stand-up coda about the perils of constantly defending his stance as a male heterosexual. It’s a great kicker to assure us Louie will no doubt be back in his cocoon of loneliness and fumbling starvation for companionship next week. • We’re operating at a rate of at least 50 percent of Louie’s screen time involving eating. • Can we talk about Louie’s glasses? And his audacity at just wearing those things and not addressing it?! • Louie joining the neck-brace-wearing, blobby-bodied crowd of Olds overtaking the beach at dusk, and only then ditching his stalwart black T-shirt, was a sad, sad victory. • Having breakfast and reading by the pool is one of the only times we’ve ever seen Louie relaxing without anxiousness. So he has to get riled up over an entitled bikini babe snatching his strawberry. • That goofy flight attendant voice over the PA had to be C.K., right? • Viewers used to C.K.’s absurdities may shrug off Louie’s tale of coming to the U.S. from Mexico as a youngster, but it’s factual.